It “just happened.” I’ve seen that phrase through the Bible and it always makes me chuckle a little bit. See what it says in Ruth 2:2-3. 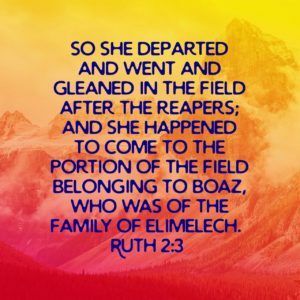 So she departed and went and gleaned in the field after the reapers; and she happened to come to the portion of the field belonging to Boaz, who was of the family of Elimelech. When God is in control, it’s amazing what just “happens.” Naomi thought she was alone, but she wasn’t. Ruth came up with an idea to help them survive and she “just happens” to end up in the exact right place with the exact right person. God is constantly working and moving in our lives. There are no coincidences or happenstances. God is too good of a planner and loves us too much to leave something as precious as you or I up to mere chance. God has a plan and is always working things out exactly as they should be so that He will get the glory and praise. There have been several times in my life when circumstances just seemed to fall together the right way. I know that God had worked and moved to bring it all together. Will we trust Him today with our very next step? We don’t have to know the full plan; we just have to trust the Planner.